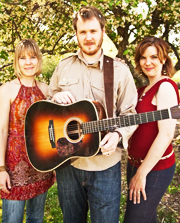 Isobelle Gunn is the London, Ontario based internationally-acclaimed acoustic vocal trio comprised of Leanna Zeyl, Jeremy Zeyl and Lara Schat-Zeyl. The musical collaboration of this sister-brother/husband-wife initiative relies on blended voices and lyrics which evoke comparisons to artists such as Sufjan Stevens, Sarah Harmer, Emmylou Harris and Iron and Wine. Isobelle Gunn began singing together in the spring of 2006 and released their debut, self-titled EP in April 2007, quickly achieving critical acclaim with the song “Emily,” which received an Honourable Mention in the ISC International Songwriting Competition (2007), in addition to other awards. In October 2007, a Creation of New Work grant from the Ontario Arts Council was awarded to Jeremy on behalf of Isobelle Gunn to write a 12 song album, which resulted in the July, 2009 release of Isobelle Gunn’s much anticipated new album, “Flesh on Steel”. The group toured the album in the summer of 2009, a tour which culminated in a showcase at the Canadian Country Music Awards, held in Vancouver, BC.